Last Sunday arrived clear and bright.The sun was out. The day just had the sense of promise about it. Certainly one of the best days we’ve had for a while. I was back in South Wiltshire’s Chalke valley with David to walk with Nigel and Nicki (Foot Trails Trail guides). Even as we drove along the Wylye valley and towards the Chalke valley we were transported back a decade ago. It was South Wiltshire’s distinctive countryside and delightful chalke valleys which first captivated both of us and inspired the idea for Foot Trails. We lived not far away at the time and have memories of picturesque and peaceful days strolling through chocolate box villages of thatched cottages and brick cottages with clear chalk waters swirling and gurgling past. 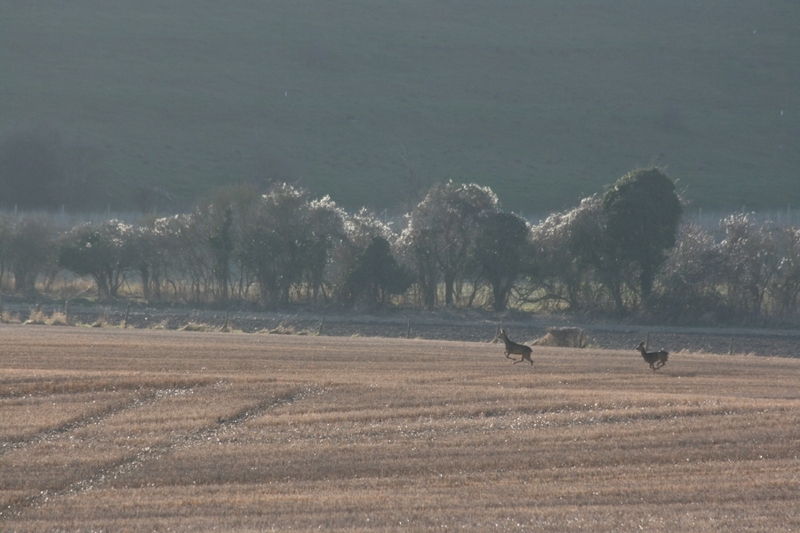 Nicki and I were lost in conversation but David and Nigel spotted these rather handsome deer in the field. As we strolled up the gentle slope the sight of Salisbury’s tall spire came into view across the fields. South Wiltshire’s countryside is so distinct and beautiful. It was great to enjoy beautiful weather, great company and stunning scenery. All the things we aspire to achieve on a Foot Trail.